Sean Connery defined the cinematic James Bond. His style, grace, sense of self, and sheer magnetism bought Ian Fleming's character to life. 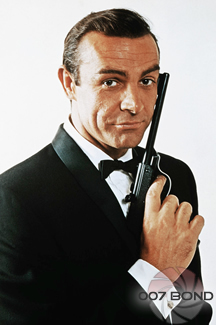 It was Connery's interpretation of 007 that helped establish the foundation of success upon which the entire James Bond series has been built. Connery's upbringing in the working class Fountainbridge neighborhood of Edinburgh was a far cry from the privileged British "old boy" network of Ian Fleming and James Bond. Connery's father, Joseph, was a lorry driver who prided himself on neer missing a day's work. After leaving school in his early teens, Connery worked on a milk delivery route which included Fettes, the exclusive Edinburgh boarding school where Ian Fleming placed a young James Bond after expulsion from Eton. While the fictional Bond learned the classics at Fettes, Connery worked to support his family. Connery had many jobs before he joined the Royal Navy, hoping to see the world. He served as an able seaman assigned to battleships, training in gunnery school. Discharged with ulcers, he returned to Edinburgh, where he trained as a French polisher before deciding to enter the Mr Universe contest in London in 1953. Connery earned a bronze medal in his weight division, but it was clear that he had no future as a professional bodybuilder. Another competitor mentioned auditions for a touring company of South Pacific. They were looking for male dancers for the sailor's chorus. Connery, who had appeared as an extra in a play in Edinburgh, landed a role in the chorus and soon afterwards set off around the country as a professional actor. "The person who plays Bond has to be dangerous"
Connery's new job as an actor almost lost out to a career as a professional footballer for Manchester United. On tour with South Pacific in Manchester, the production played against the football club's junior team. Matt Busby, the United manager, approached Connery and offered him a contract to play. Connery asked fellow actor Robert Henderson for advice. The older actor advised Connery to take the long view. Connery considered that a footballer's career would end by 30, but an actor could act forever. He dedicated himself to studying the classics at local libraries around the UK during his time off from his duties with the chorus. Connery struggled to build his reputation as an actor, barely earning enough to live on as part of a suburban London repertory company. However, the small company gave him the chance to perform new dramatic roles each week. His developing skills and physical presence gained Connery roles in low-budget films, including 1957's Action Of The Tiger. The film's director, Terence Young, told Connery that the part would not do much for Connery's career, but that he would hire Connery for a better role one day. Connery began working in BBC live drama productions and, when Jack Palance could not star in Requiem for a Heavyweight, Connery wom the lead role. Rave reviews led to a contract with 20th Century-Fox, more television, and a role in the 1958 Lana Turner film, Another Time, Another Place, shot in England. The following year, Walt Disney and the director Robert Stevenson cast Connery in Darby O'Gill And The Little People, which bought him to Hollywood for the first time. The next two years provided a variety of television theater, and small films but no break-out roles. Then, in the summer of 1961, now free of his Fox contract, Connery entered the Mayfair offices of American film producer Albert R Broccoli. Connery walked with smooth, graceful strides, learned in part from classes with the Swedish dancer teacher and drama teacher Yat Malmgren. His working-class background was by then leavend by relationships with beautiful upper-class women such as Jullie Hamilton and Diane Cilento, his future wife. His air of confidence stemmed from succeeding against the odds. The producer Albert R Broccoli, his producing partner, Harry Saltzman, and United Artists executive Bud Ornstein watched Connery stride across the street after leaving. "He moved," Saltzman recalled, "like a big jungle cat." He would, they felt, be perfect for the role of James Bond. "I care about Bond and what happens to him." By the time Connery retired from playing 007 in EON productions' Bond films, his 007 adventures had grossed over $600 million. He had also starred in movies directed by Alfred Hitchcock, Sidney Lumet, and Martin Ritt. In the 1970's, Connery established himself as an actor who could bring success to diverse films. He took on larger-than-life roles, such as the Raisuli in The Wind And The Lion (1975), Kipling's legendary Daniel Dravot in The Man Who Would Be King (1975), and Robin Hood in Robin And Marian (1976). In the 1980's, he won an Academy Award for Best Supporting Actor in The Untouchables (1987) and played the irascible father of Indiana Jones in Indiana Jones And The Last Crusade (1989), for which he received Golden Globe and BAFTA award nominations in the Best Supporting Actor category. By the 1990's, Connery could develop and produce films in which to star. He received a Lifetime Achievement award at the 1996 Golden Globes, a gala tribute at Lincoln Center, and praise from President Bill Clinton for his contribution to the arts. Connery received a Knighthood on New Year's Day, 2000. In 2006, the American Film Institute awarded Connery a Lifetime Achievement award, and he is recognized as one of the most influential and successful actors of the past half century.